So, I'm new here (this is my first post) and new to Traditional Archery. I just bought a Martin Hatfield from a guy and I'm still waiting to get it in so I can go out and shoot it. I'm hoping I will have had enough time to learn how to shoot in the next 2-3 months to be able to go out and chase some spring black bears. I have never hunted bears before so this will be all kinds of a new experience for me. I was just wondering if you guys had any advice for me for trying to get one of these critters and to stay safe while doing it. I don't think my wife would ever let me go hunting again if I got hurt. She understands my passion for hunting, but I think she'd rather have me around then get hurt trying to hunt. Also, if there is anything that you guys have already posted on this please just shoot me in the right direction. I'll be honest, I haven't read all 5 pages of posts that are available from the last 75 days, yet. Welcome to the world of traditional archery.Take this with a grain of salt, its just my opinion. 2-3 months is not a whole lot of time when your talking about learning to shoot a traditional bow instinctively. I think your time would be better spent stumpshooting and target shooting for the rest of the year, and then hunt deer or elk next fall, if your confidence and accuracy are there. Trust me, I understand the wife issue. I live in Montana, and I hunt alone. It drives my wife crazy. Truth is, they have good reason to be nervous. As you know, Montana can be an unforgiving place on its best day. Throw in a wounded predator to the mix, and it can get downright tragic. I completely understand that it might be impossible to get to that point in the next 2-3 months. My goal is to get there, but if I can't then I'm okay with that. I'd rather be comfortable and know that I can make a shot than to shoot at an animal, especially a bear, and wind up injuring it. Thanks for the advice. Welcome Shane! I'm glad to hear you're looking to jump into traditional bowhunting. There's nothing quite like it! You'll be glad you did! I don't have nearly as much experience with bear hunting (my only dangerous game experience) as many here, but I can say that if you're going to go bear hunting on the ground spot and stalk with a traditional bow, you need to have a predator mindset. If all you will do is worry about getting hurt, you won't have fun, and you won't close the range or thoughtfully make key decisions, or potentially shoot poorly. I'm speaking from experience. Every stalk will be dreaded. Now, with that said, fear is a double edged sword. It can paralyze or drive us to do extraordinary things. The danger aspect can be thoroughly exhilarating. Being on the ground 20 yards away from a blackie is an awesome experience. That particular exhilaration will not come without the potential for injury. I've never been "comfortable" this close to bears, but I have been confident. To me, that makes all the difference. In my opinion, if you're worried about getting hurt and working up the wife, pick up a rifle and get it done that way. You could also consider bringing along a rifle backup as well. I'd recommend you shoot some other game with the Martin to get your confidence up. Then when you have the confidence to make the shots under adverse conditions, try for black bear. Bad shots will happen from time to time...we're human, but we need to be to the point where we're confident in our abilities. No one can tell you when you're there...only you can. We owe our quarry nothing less. Although, any bear can be dangerous, females with cubs are to be avoided. Knowing the anatomy of a bear, where and at what angle to make the shot is very important. Learning how to sharpen broadheads, judging distance and being able to keep your shots within a pie plate is key to success. Practice, practice and practice some more everyday for 2to 3 months and you will know if you are able to kill a bear. Start close and move out as you gain confidence, and you should be ok. As said in the previous posts, make sure you know you animal and make sure you broadheads are deadly sharp. Good luck and let us know how it goes. P.S. what weight bow you shooting? I am going to be spending the month of May as camp cook in my buddie's bear camp. I have never hunted bear, never really been all that interested, and this is gonna be a great learning experience for me. One thing that I have already decided is that since it is really not gonna cost me a whole lot I am gonna watch more bears that I am ever gonna shoot and unless I get what I consider to be a sure thing shot I will simply not take one. I like the term intuitive shooting more than instinctive and I believe that intuition is the one thing we need to believe in. Sometimes I can pick a very small spot and hit it. Sometimes I am not even close. One thing I would recommend is getting a really good broadhead target and spending a lot of time shooting broadheads, not for group though, just one for kill zone. The can be a pretty sobering experience. I have a hard time believing that anyone can become a hunting ready traditional archer in less than a year. You alone though have to be the judge of that. Just for fun check out the Quartermoon Bows website. Bert lives in Pincher Creek in Southern Alberta and you will see a picture of him with a Kodiak bear that is not all that big as such bears go. I was teasing him about the size and he politely informed me that at 7 yards that bear was plenty big enough. Shane, I lived I Montana for 4 years and hunted Black Bear all that time. I had stalked 4 bear before finally bringing it all together. The difference between them and a whitetail, in my experience, is that when a whitetail hears you it looks right at you waiting for a 2nd sense confirmation. The bear heard me and never picked up their head but just bolted. My harvested bear had a P&Y score of 22 1/8" and was huge. I stalked to within 17 yds. and then put an arrow through him with my 72# Howatt Hunter. It is a thrill and a half from the ground! One thing, if you're gonna be hunting bears in Montana ,if you don't already know, learn to tell the difference between color faze black bears and grizzlys. Mostly that's hunting near Yellowstone or the Bob but it doesn't hurt to know, just in case. Also as already said, learn blacky anatomy and be sure of your shooting ability. In Montana you can carry a pistol backup but its not usually necessary in my experience. Ditto. 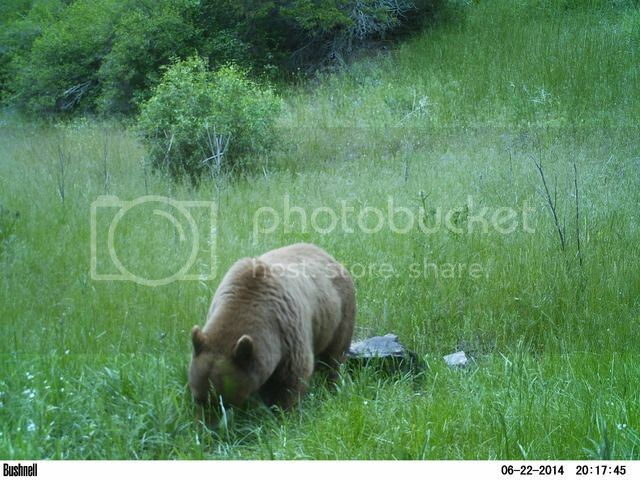 I shot a cinnamon colored black bear in the late eighties from the ground while elk hunting in the Big Sky area (back side of Lone Mountain from the resort). Lots of grizzly bear sign in that area at the time between Lone and Fan Mountain. I had a .41 caliber Magnum pistol in my tent but still slept very lightly. Black bears die very easily when hit right. So accuracy and sharp broadheads are key. I've shot three black bears and the farthest trail was sixty yards. I've been on a few trails with poorly hit bears that went over a mile and no bear found. I live in mt and hunt black bears alot.in my part of the state (nw) I walk a series of gated grassy logging roads in the spring. Moove slow and look for fresh poop. Seems like I always see em as I come around a corner with their head down eating grass in the afternoon and evening. You cant beat their nose so wind is everything. If I cant sneek up (boots off) then ill blow on a johny stewart preditor call. They like it. Be ready if you do this cause they are comin to eat. Soo much fun. Just practice every day and get in the woods. You learn from failures. Get someone who knows what theyre doin to let you tag along. Enjoy the ticks and skeeters. Good luck. I grew up in Montana but have not lived there in thirty years or so. Ditto on the color faze and logging roads. Find an old closed logging road or two and you are in business. They love eating the grass early in the season. My first bear was a color faze and it all happened so fast that I scared myself. Thank goodness it was not a grizzly. If I am not mistaken I believe you have to show proof or take a bowhunting education class before purchasing a bear tag in Montana. If you were born after a certain year,you need to have taken a bowhunter education course to bowhunt. To hunt bears,you need to take a grizzly bear identification test.This can be taken over till you get it right.It's more of an educational thing to get you to understand the differences and how to tell them apart,even when colors are similar.It can be taken online.